So you want a pet cat. Are you sure? Have you thought about it carefully or is it just a whim because you saw a cute kitten at the pet shop. The first thing to consider is that an indoor cat can easily live for 15 years, so it's a major commitment. Most of us have no idea where we'll be or what we'll be doing in 15 years. Cats are often thought to require less work than dogs. And in some ways that's true. But while a cat doesn't need walking three times a day, it still has physical and emotional needs that require your time. Providing food and water for your cat are the easy things. Your cat will needs attention and affection. 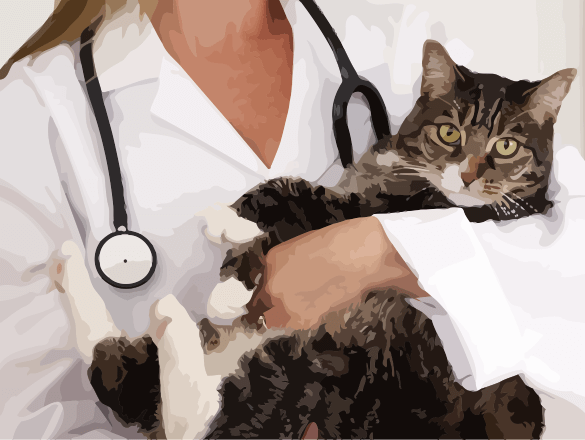 You cat will invariably get sick at some point that will likely require vet care. And when you go on vacation, who will take care of your cat? But I'm sure you've thought long and hard and you're sure you want to get a kitten. They're so cute, especially the way he looks at you with those big eyes. So with that, let's look at a few considerations before you actually get one. Right away that kitten will need special kitten food, a dish bowl, a water bowl, litter, and a litter box. This should cost you about $100. The food and litter will be about a $50 per month expense, so make sure you budget for it. You will also need to buy a few kitten toys and a cat bed. That's another $30 or so. If the cat has not already had its vaccinations and de-worming this will need to be done ASAP. This will be two visits to the vet, one month apart, with each visit costing around $40. Do you plan on neutering/spaying your cat? Most likely. If you don't, you will regret it very quickly when they go into heat and they start squirting this foul smelling liquid throughout your home or when they start yowling their mating call. Anyway, that's another $60 or so. Will you be getting a tracking chip for your cat? In some countries or jurisdictions it is a legal requirement. So, another $30. Even though your cat seems healthy today, they can be injured or become sick and you will need to take them to the vet. Depending on what they need it can cost you a couple of hundred dollars. If your cat will be going outside it will eventually catch fleas. So, budget for about $15 every time your cat needs to be de-flead. Who will look after your cat while you go on vacation? Friends may not be willing to do this. Not everyone has spare time and not everyone is a cat lover. Will you pay for a cat hotel? You might want to check the cost of this before you proceed, it might shock you. Who will regularly play with your cat? If it's you, do you have the time? Do you have the energy after a long day at work? Are there any other pets in your house? What if they don't get along? Are there children or babies in your home? Cats can get jealous. And while generally speaking cats are not violent animals, when they are scared or cornered they can deliver some pretty nasty scratches. What if in the future you move to smaller accommodations? Will the cat be happy in a smaller place? If you move into a condominium unit, will cats be allowed? Be aware of fur. Unless you totally shave your cat you should know there will be cat fur everywhere. Some cats shed more than others but they all shed. You will never be able to get rid of the fur no matter how much you clean. Make sure no one in your home is allergic to cats before you bring one home. How about your furniture? Are you OK with several claw marks on your expensive leather couch? It will happen without a doubt. Do you know about zoonotic diseases? These are diseases that can be transferred from an animal to a human. It may not happen often, but you should learn about them first, especially about toxoplasmosis which is particularly bad for pregnant women. Kittens are really cute, but grown cats aren't as cute. Will this make you change your mind? Be aware of getting a pet for your kids. Many parents assume that kids will learn to be responsible because they adopt a pet. Most children simply do not understand what it means to have and to take care of a pet, and the onus will most likely fall on you, the parent. Also consider that children will prefer to play with their friends over changing the litter and they will become increasingly busy as they get older. While in many ways it's great to have a pet, and I'm not trying to discourage you from having one, there are things to know before you proceed. Because once you make the move, it's pretty hard to go back. Something else to seriously consider. There are many cats that need adoption. Consider this versus buying a cat from a pet shop. By adopting you will be saving a cat from possible euthanasia. Another advantage is that it will already have its vaccinations and will most likely already by neutered. In addition, most cats will be grateful, and yes, they can tell when they have been saved. Visit your local shelter and see if there is a cat there that you like. Lastly, consider the match between you and your cat. If you haven't had a pet before, yes, they do have their own personalities. Some are hyper and outgoing, others like to sit in the corner most of the day. Some cats like a quiet environment while others like to socialize. Also, don't fall into the trap of thinking that you need to purchase a pure-breed cat, thinking they will be better or healthier. Many pure-breeds suffer genetic diseases, simply because their genes don't have a chance to mix with other breeds.